This is a partial preview. Full document is 1125 slides. View large preview. Impress your audience with a more enhanced and professional powerpoint presentation. Over 1100 wide-ranging diagrams, templates, graphics and icons that are easily adaptable to your specific applications. Fully-editable diagrams, templates, graphics and icons. 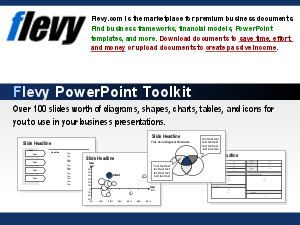 This presentation is a mega-collection of over 1100 fully editable consulting diagrams, templates, graphics and icons to enhance your PowerPoint presentations, increase productivity and create visual impact. The above preview only displays less than 10% of the slides. - Communicating high-level project milestones and project status, etc. PowerPoint Diagrams Compilation? Bain Frameworks? Total Quality Management? Or something else.